Can Shostakovich Escape Our Demands for a Political Martyr? The Seattle Symphony plays the complete concertos of Dmitri Shostakovich on January 19 & 20. Crowds gathered outside the Waldorf-Astoria Hotel in New York. Demonstrators marched in the streets. Placards reading “Shostakovich! Jump thru the window!” bobbed in the picket lines. Dmitri Shostakovich stayed in bed. The Cultural and Scientific Conference for World Peace, held in New York City in 1949, was one of the first great propaganda battles fought between the United States and the Soviet Union at the start of the Cold War. 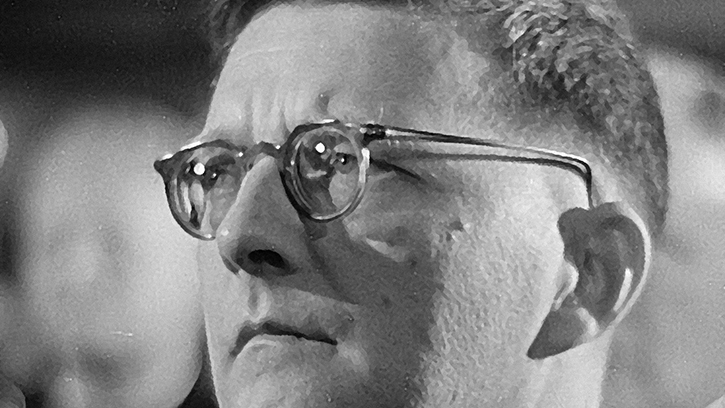 Shostakovich’s Fifth and Seventh Symphonies were widely popular in the United States during World War II, and, during his visit to New York, the press feverishly covered his appearances. On the final night of the conference, Shostakovich played a piano arrangement from his Fifth Symphony for an audience of eighteen thousand in Madison Square Garden. After the iron curtain began to fall, U.S. audiences wanted to claim the Soviet composer as a kindred spirit, a martyr for freedom of expression. Over the years, that mythology has taken root and grown around Shostakovich, threatening to bury his music behind the two-dimensional caricature of a political dissident. Although debate will continue for years over his life and music, we know that Shostakovich was skilled at courting and wielding political power. He was an outwardly loyal supporter of the party, who, at times, despaired about his role in promoting a regime that punished his colleagues while rewarding him with fame and influence. Through Shostakovich's concertos, we experience the wit, the irony, the hope, the despair and even the joy that fills his music. We meet Shostakovich on his terms. Before he arrived in New York in 1949, Shostakovich answered his phone one day and was told to hold: Comrade Stalin wanted to speak to him. Stalin expressed surprise that the composer had declined an invitation to attend the peace conference in New York. Was he feeling unwell? Shostakovich replied that he was, in fact, feeling nauseated: the music of his fellow composers, Sergei Prokofiev and Aram Khatchaturian, had not been played in the Soviet Union in over a year. Many of his own compositions were banned. Silence. Finally Stalin spoke, promising that he would correct those “illegal” orders. Shostakovich went to New York. After returning from the conference, Shostakovich repaid Stalin with several works, including an oratorio, The Song of the Forests, and the film score to The Fall of Berlin. In return, his music was performed throughout the USSR and he received privileges reserved for the party elite: political power as the head of the Russian Federation’s Union of Composers and private residences in the countryside where he spent summers composing. Calling Shostakovich, or any Soviet composer, a political dissident is problematic for many reasons. When the state owns everything — from apartments to concert halls and violins to orchestras — music doesn’t exist outside the government. It doesn’t exist at all. Instead composers, like artists everywhere, learn a delicate social dance to promote and secure support for their work. We live out our lives in front of a tapestry of political and world events, our own memories more vivid and poignant than something happening a world away. Artists are no different. Shostakovich’s concertos, written for close friends and family members, span his career and provide glimpses into the development of one of the twentieth centuries most influential composers. From his piano concertos, written first for himself and then for his son; to his violin and cello concertos, dedicated to his closest friends; we can experience the wit, the irony, the hope, the despair and even the joy that fills his music. We meet Shostakovich on his terms. Ultimately, Shostakovich’s contradictions — loyal party supporter and artist conflicted by private doubts — are what make his music so powerful. When we force an artist into a frame that fits our desire for ideological purity, the contradiction of their art is lost, filled instead with our own implicit biases. Without the imperfections, we are left with only the propaganda. Imperfections create space for our own emotions, thoughts and experiences to enter the music. Seats are going fast — reserve your place at the Shostakovich Concerto Festival, January 19 & 20!